Tracey Slider was frazzled and had reached stress levels she had never before encountered. She was not smiling, she was abrupt with Jake, she could not sit still for more than ten minutes at a time, she was not sleeping well and a sense of impending disaster monopolized her thoughts. She was doing her best to manage every penny she was earning but there are no finish lines when you are riding on a merry-go-round. It was November 12, less than two weeks until Thanksgiving. Tracey had worked her six hour shift and, upon clocking out, started to do shopping for the family. She knew to the penny how much was in their checking account, $143.00. She filled the cart with about $60.00 worth of grocery items including two cans of cranberry sauce, two cans of corn and two cans of sweet potatoes which would be used for Thanksgiving. There would be $83.00 left and $75.00 would go to the electric company as per her arrangement with them. There was enough gas in the truck to get them through payday which was four days away. She was proud of herself and deserved to be. She was like a car running on fumes and now the gas station was in sight. Tracey unloaded her items onto the checkout counter and watched as her friend, Helen, scanned the items. They were chatting about nothing important when Helen said, "Okay, Trace, that comes to $60.28." Tracey smiled, "I can't believe it. I wanted to spend $60.00 and I went 28 cents over. Not bad." She swiped her debit card and keyed in her pin number. A message popped up, Insufficient Funds. Tracey was startled and smiled at Helen. She swiped her card again. Insufficient Funds. She looked at Helen, "I don't understand." She tried again. Insufficient Funds. Customers were lined up in back of her. She was wearing the store's company uniform. It is a fact that humiliation can embrace a person in a nano-second. Tracey instantly wanted to be somewhere else. She fought the panic rising within her and garnered some composure. She took a deep breath through her nose, exhaled and said, "Okay Helen, I'll just leave the stuff over here. I'll be back in 15 minutes." She left the store, got into Bob's truck and began to tremble. Taking a few more deep breaths she wiped her teary eyes and headed home. All she could think was, It has to be a mistake, it has to be a mistake. How could they do this. She hurried into the house and right past Bob who was sleeping on the sofa. Sitting down at the computer she logged into her on-line banking site. The screen opened, she keyed in her password and stared at the screen. Balance--negative $89.00. Transactions--there had been two. Friday afternoon a $100.00 cash withdrawal had been made and another one for $60.00. Then there were two bank charges of $36.00 each, one for "insufficient funds" and one for an "over limit" fee. She stared and stared. She thought ---I don't understand--I didn't---Oh my God----She jumped up from the chair and rushed into the living room yelling, "Bob, Bob, wake up! Wake up!" He remained still and quiet on the sofa. She started yelling at him and pushing his shoulder, "Bob, wake up right now. C'mon, wake up!" Her groggy husband opened his eyes. "Huh---what? I'm sleeping. Leave me alone. What's your problem anyway?" "Did you take money from the ATM yesterday?" "Huh---the ATM. No--I don't think so. What's the difference anyway?" ""Oh my God, Bob, you did--didn't you." "Fine Tracey, I did. So what. I needed some medicine and I can't get any until next week. So yeah, I took some money. I suppose I should just lie around here in pain. Now leave me alone." "Oh my God, Bob. You're buying drugs. You're buying drugs.You took our food money and our money for the power bill and bought drugs from someone. Your stupid two withdrawals overlapped and you caused us to be minus $89.00 in our account. How in God's name could you do this to me and Jake. How could you?" Bob was pretty well stoned so he shrugged, rolled over on his side and went back to sleep. Tracey looked down at him and at the moment all she could feel for her husband was contempt. This author is going to be interviewed today on my radio show Stories From Unknown Authors which can be heard at http://blogtalkradio.com/storiesfromunknownauthors at 11 am EST. Larry will also be offering a giveaway for his book that will be ending in mid October. Rules: You must be a GFC member through my blog as well as join Larry's website and/ or blog leaving a comment as well. Good luck to all. From the Webster Dictionary: Con' se-quence, n.---that which follows as the result of some preceding act, cause, etc. For the Slider family the act was Bob's driving into the side of a new Toyota as he parked his truck. The cause was his having taken too many prescription pain pills that had severely dulled his senses. Did this just affect Bob? Not quite. Consequences oftentimes have this insidious ability to give birth to tentacles that reach out and wrap themselves around others in an unexpected and seemingly inescapable grip, clutching so tightly that the person(s) trapped have no idea how to break free. It also follows that the first people these tentacles reach out for are those closest to the person who had activated the whole process, in this case Tracey and Jake. Having one vehicle had been sufficient for Tracey to get back and forth to her part time job, for Bob to go back and forth for doctor visits and his 3x a week physical therapy treatments plus, get Jake to his after school activities, winter baseball practices and weekend games. Now it was all on Tracey. She had to somehow get her husband and her son to where they were supposed to be and still be at work. It was a daunting, almost impossible task. The consequences of Bob's Halloween "fender-bender" included his having to put in three hours a week of community service (which he was able to do at the St. Vincent De Paul Thrift Store) sorting and separating donated clothing. He needed 50 hours so this was, at best, a 17 week commitment. He also had to go to DUI class, the "Law & Substance Abuse Program", get to physical therapy and, of course, report to his parole officer once a week. .
Tracey managed, after some serious pleading, to get her manager to let her begin working from 6:a.m to 11: a.m. Thursday through Sunday. This gave her Monday through Wednesday to schedule Bob's probation requirements and PT appointments. It was, to say the least, a tenuous arrangement. Bob had to be somewhere at least four times a week. Since his dad's appointments were "absolutely necessary" to keep, Jake was forced to quit playing winter baseball. There was no way Tracey could get him back and forth to practices and games, get her husband to his various appointments, get to work, run errands, and do all of the other things that take place outside of the home. Jake took this very hard. He tried to understand but he didn't. Baseball meant so much to him. It ain't fair. How could they let this happen. It ain't fair. It really was not the baseball. After all, it was only winter-ball, sort of an instuctional league where the kids prepared for the regular season. It was just the catalyst that drove the boy's feelings to the surface and these feelings began to exhibit themselves through a sullenness, a drop in grades and, in a few instances, by playing "hooky". Tracey, like her son, was slowly developing an unwanted bitterness towards her husband, the man she had truly loved since high school. She had the inner strength to deal with all the adversity, confusion, tension, financial chaos, and the mountain of uncertainty that had entered her life over the past year. What was seeping into her psyche was that Bob had turned himself into a "victim" and had climbed upon a train called the "Pity Party Express". This journey that he had embarked upon was like a slowly moving knife, cutting deeper and deeper into his wife. Bob had no idea and could not see past himself or his need for "medication". FINALIST - "50 Great Authors You Should Be Reading"
The 2011 edition of “50 Great Writers You Should Be Reading” will feature the fifty most interesting and engaging authors who were interviewed on any of our six shows under the umbrella of THE AUTHORS SHOW in 2011. FINALISTS - SCROLL BELOW TO SEE ALL FINALISTS!!! The selection of finalists is based on a set of criteria developed by the show producer. All finalists will receive a digital seal recognizing them as finalists in the 2011 edition of "50 Great Writers You Should Be Reading." All finalists go to the voting phase. The public will vote digitally for their preferred author(s) in the finalists pool. The 50 authors with the most votes will be included in the 2011 edition of "50 Great Writers You Should Be Reading." All winners will receive a digital seal recognizing them as winners in the 2011 edition of "50 Great Writers You Should Be Reading." A link to the voting page will be added here soon. 1) Intro: "Homelessness and the Grippers"
2) Episode #1: "Meet the Slider family"
3) Episode #2: "Bob Slider is laid off"
4) Episode #3: "Confronting finances over beer & pizza"
5) Episode #4: "Meeting with the landlord"
6) Episode #5: "Running out of money"
7) Episode #6: "Out of money"
8) Episode #7: "Lights out"
9) Episode #8: "Here come the church people"
10) Episode #9:"The Home Visit"
11) Episode #10"Good news & Bad News"
12) Episode #11"What about Jake?" 13) Episode #12"Trick or Treat"
Episode #13: "Getting out of jail--Now what?" Bob Slider, husband, father, hardworking family man and solid citizen had gone through an unwanted and unexpected metamorphosis. Reborn into a strange world of unemployment, disability and prescription drug addiction, he now found himself being processed into the county jail. After enduring the indifferent, matter-of-fact fingerprinting, mug-shot taking and humiliating strip search, he was placed in a holding cell with a bunch of other guys. Some were laughing, some were crying, some were trembling and some appeared to not give a damn. One thing was the same--they all were wearing freshly laundered orange jump suits with bold, black letters emblazened on the back that said, COUNTY JAIL. As for Bob, his back pain was raging, he was feeling frightened, lost, victimized, misunderstood and strangely, all he could think of was one thing, I need my pills. Bob, because he had never been in any kind of trouble before, was released at 10 a.m. the following morning on ROR (on his own recognizance). Judi Pavano had to drive Tracey to the jail to pick Bob up because his license had been temporarily suspended and his truck impounded. Judi waited in the car while Tracey met Bob at the jail exit.When he saw his wife he began to cry. She could not believe how pathetic he looked. She, too, began to cry. They hugged each other for several moments and then Bob took a breath and asked Tracey, "You got my pills?" "Uh---no Bob, I don't. C'mon, let's get you home." "I need the pills Tracey. I can't believe you didn't bring them. I'm so sick. You don't understand, I need my medicine." She was a bit stunned that his primary concern was his pills and it was this moment that impacted her with the reality of his addiction "Okay, okay. We'll be home in 15 minutes. Just hold on." Bob's blood work and urine sample showed that he had more oxycodone and xanax in his system than had been prescribed. His license was officially suspended for six months and he was fined $250.00, the minimum allowed under the law. He also was sentenced to complete a "Law and Substance Abuse" program and received one year probation which also included doing 50 hours of community service. Since his truck was the family's only means of transportation it was released from impound for Tracey to use. Being caught up in the criminal justice system was a miserable, unpredictable and downright scary place to be. Factor in two extremely painful, herniated lumbar discs that almost prevented him from standing up straight and having no money pushed Bob Slider into a deep pit of despair. He was pulling Tracey and Jake with him but Tracey had an unknown inner strength and resolve inside herself that would enable her to pull back and fight the forces working against them. Next time: Episode #14: "Living with Consequences"
I have always wanted to be a writer but my journey to get there followed a convoluted path that found me spending 15 years working in the building trades in New York City, having to leave that business because of something called MS, an acronym for an insidious illness called Multiple Sclerosis, that short circuits your nervous system leaving varied results for different folks, in my case stumbling around like a drunk and then being almost unable to walk at all. That was 30 years ago and, today, after a lot of hard work and prayers, I use no walking aids and get around just like most everyone else. My wife, Loretta, my three kids and I moved to Florida (doctor's advice) when this was all "going down" and I have been here ever since. Loretta died nine years ago from Melanoma and I married a widow four years ago (a great gal named Marty) who is now undergoing chemotherapy for Lymphoma. I also had prostate cancer and after a radical prostatectomy four and a half years ago, I'm doing great. Seems that cancer is like Al-Queda---always sneaking around and attacking people trying to kill them. Fortunately, due to incredible advances, cancer is not nearly as successful as it use to be although there is still a long way to go before, like Al-Queda, it is irradicated. So---I am a husband, father, grandfather and officially a "senior citizen" and what am I doing now is writing, with one of my genres being children's books. It is my "permanent senior moment". It's ALL GOOD. Enough of the "me" stuff. Let's get to the book. 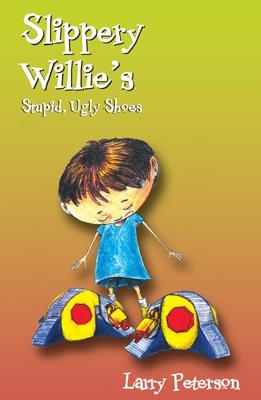 The title is "Slippery Willie's Stupid, Ugly Shoes". This is my first published children's book and it is about a boy who has slippery feet. No one, not even the smartest doctors around, can figure out why Willie has slippery feet. He just does and that is all there is to it. Naturally, because of his slippery feet, Willie just slips, slides and spins all over the place. He cannot run because he starts to slide, he cannot climb a tree because his feet slip off the branches and he cannot ride a bicycle because his feet slip from the pedals. 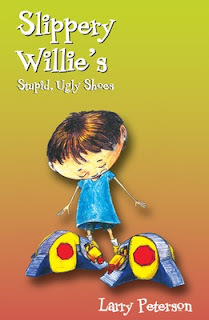 Willie hates his slippery feet but what he hates even more are the special shoes that have been made for him that will stop all the slipping and sliding and spinning. Willie thinks that they are the stupidest, ugliest shoes anywhere and he is positive that, if he wears them, everyone will laugh at him. He discovers that sometimes we worry about things about ourselves when actually there was nothing to worry about in the first place. The message in the book is about accepting "differences" in each other. Many kids think that, in some ways,they are different than other kids; ears are too big, nose is too large, hair does not look right, etc. Often times it can be a self-esteem issue and low self-esteem is one of the reasons some children are succeptible to bullying. The book has an intercative guide that addresses these issues and can be used in a classroom setting. Summer and the balance of September were gone and October had taken the time baton and charged forward. It was Halloween and the Sliders were now full fledged "Grippers" financially drowning and just barely "treading water" as they tried to avoid being sucked under and lost in the abyss of abject poverty. They had been tossed one lifeline which Tracey grabbed onto. Through her friend Judi's recommendation she had been hired as a part-time cashier at the local supermarket. She was working 20 hours a week and being paid $12.00 an hour. Her first bi-monthly paycheck had come in and she had received $390.00. At $780.00 a month they were now $256.00 a month better off than when receiving unemployment. The extra good news was that the possibility of being promoted to full-time was very real. Bob, unable to collect unemployment, was moving around very slowly because of his injured back. He had qualified for medicaid through the Department of Children & Families and he was going to physical therapy three times a week. He was also taking oxycodone pills three times a day and had been prescribed xanax to help him "relax" . It had taken less than two months for him to become addicted to these pills. The once happy-go-lucky, vibrant, hard working husband and father had turned sullen and quiet and was absorbed in his own personal "pity party" telling his wife, "You just don't understand. You have no idea how much pain I'm in." He was wrong. She understood much more than he thought she did. She realized the pills had changed him dramatically and that all he seemed to be concerned about was having enough of them. It was 8 p.m. on Halloween. Tracey was next door at Judi's and they had been greeting all the little "trick or treaters" since six o'clock. The onslaught of monsters and ghouls and super-heroes and various other creatures was almost down to a trickle so they went inside to have some coffee and chat. Tracey thought she heard Bob's truck start and hurried to Judi's front door. She was just in time to see his truck going down the street. Wonder where he's going, she thought. Hope he's all right. He wasn't all right. Having taken too many xanax along with his oxycodone had caused him to "fall asleep" as he pulled into the convenience store a half mile from the house. He proceeded to unceremoniously smash into the side of a new Toyota Corolla. By 9:30 Bob was in handcuffs and on his way to jail. Charges were DUI with property damage. Tracey would not hear from him until 11:30. By then she was frantic about where he might be. When she heard her husband tell her that he needed to be bailed out of jail her mind went momentarily blank and she almost fainted. Fortunately, Judi and Tommy were both there. Judi, standing next to Tracey, quickly put her arm around her and helped her to sit down. She took the phone and began to gather the information from a nervous voiced Bob. Tommy quickly sat next to Jake who had started to cry. More dark days were ahead. Next time: Episode # 13 "Now what?" Lest we forget 12 year old Jake. What has been going on with him through all of this? Jake, an only child, (he did not know that he had a sister that had been still-born two years before he had been born) had been the "shining star" in the lives of his parents. However, he had not been overindulged. His parents assigned him certain chores that were his ongoing responsibility and they checked his homework every night. He received a bi-monthly allowance and if he had not completed his assigned chores part of his allowance was withheld. He was being taught that there are consequences to what you do and do not do, an extremely important lesson for the character development of any child. Bob, a blue-collar, fix-it type of guy, had Jake by his side anytime there were house or car repairs to do. Jake knew all about hand tools and power tools, could change the oil in the car, pull the spark plugs, maintain the lawn mower, mix concrete, and had, under his dad's watchful eye, replaced the broken belt in the electric dryer. Bob had Jake out in the back yard at four years old teaching him how to throw, catch and hit a ball and Jake had been in Little League since he was six. Jake loved his parents deeply and his dad was his hero. Bob and Tracey had decided to be honest with their son about the family situation. They did their best to explain the unemployment situation, why they had sold mom's car and the two TV's (they still had the big TV in the living room) and why new clothes and shoes for the beginning of 7th grade were going to have to be put "on-hold". Jake understood it all the best he could and was happy that his parents had trusted him with this "grown-up" information and had confided in him. What he did not understand were the changes in his parent's moods, their new abruptness, their ongoing pre-occupation with things inside themselves and the sudden lack of laughter as the joking around and good natured teasing that used to seem to always fill the air was mysteriously absent. Bob had no idea the effect his new found cranky quietness was having on his boy. Bob had always taken good care of his family and was proud of it. But his ego had taken a hit when he was laid off even though it was not his fault. Suddenly, not having the necessary monies available for paying bills and taking care of other things was new found territory he was traveling in. He could not turn around and go back to where he had been and this provided another heavy shot to his ego. The two roofing jobs and work for his landlord gave his ego a temporary reprieve. It had felt good to be sweating again. Then came the back injury. Making things more stressful than they had been was the fact that he had been cut from unemployment because his injury had caused him to be temporarily unable to work. He had been humiliated once again when he was forced to apply to the Department of Children & Families for emergency medical assistance (only poor people get medicaid) and that application was still pending. The fact that he had applied enabled him to get some medical help contingent on the application being approved. It also allowed him to acquire his new monthly prescription of 90 oxycodone pills for "pain management". Quickly and unexpectedly those pills were becoming his "new best friend". He was supposed to take three a day. A few times he took four. The problem with that was a person would run out of their "meds" prior to the renewal date and with strict rules in place about prescription renewals, especially on "controlled substances", being out of an addictive medication two or three days before it could be refilled could present quite the dilemma for the patient. The fiend called withdrawal would rear it ugly head. Jake, bewildered at his father's behavior, did not and could not understand. He began to withdraw into himself, his grades began to slip and he was suddenly feeling insecure and unhappy. Tracey was beginning to notice the changes in her boy. As for Bob, he did not have a clue. Next time: Episode #12 "Trick or Treat"